What do brain machine interfaces and Open Science have in common? They are two examples of concepts that I never thought I would get to see materialised in my lifetime. I was wrong. Kiwi Open Access Logo by the University of Auckland, Libraries and Learning Services is licensed under a Creative Commons Attribution 3.0 Unported License. I had heard of the idea of Open Access as Public Library of Science was about to launch (or was in its early infancy) . It was about that time that I moved to New Zealand and was not able to go to conferences as frequently as I did in the USA, and couldn’t afford having an internet connection at home. Email communication (especially when limited to work hours) does not promote the same kind of chitter-chatter you might have as you wait in cue for your coffee – and so my work moved along, somewhat oblivious to what was going to become a big focus for me later on: Open Science. About 6 years ofter moving to New Zealand things changed. Over a coffee with Nat Torkington, I became aware of some examples of people working in science embracing a more open attitude. This conversation had a big impact on me. Someone whom I never met before described me a whole different way of doing science. This resonated (strongly) because what he described were the ideals I had at the start of my journey; ideals that were slowly eroded by the demands of the system around me. By 2009 I had found a strong group of people internationally that were working to make this happen, and who inspired me to try to do something locally. And the rest is history. What resonated with me about “Open Science” is the notion that knowledge is not ours to keep – that it belongs in the public domain where it can be a driver for change. I went to a free of fees University and we fought hard to keep it that way. Knowledge was a right and sharing knowledge was our duty. I moved along my career in parallel with shrinking funding pots and a trend towards academic commodification. The publish or perish mentality, the fears of being back-stabbed if one shares to early or too often, the idea of the research article placed in the “well-branded” journal, and the “paper” as a measure of one’s worth as a scientist all conspire to detract us from exploring open collaborative spaces. The world I walked into around 2009 was seeking to do away with all this nonsense. I have tried to listen and learn as much as I can, sometimes I even dared to put in my 2 cents or ask questions. The biggest hurdle I have found is that I don’t do my work in isolation. As much as I might want to embrace Open Science, when the work is collaborative I am not the one that makes the final call. In a country as small as New Zealand it is difficult to find the critical mass at the intersection of my research interests (and knowledge) and the desire to do work in the open space. If you want to collaborate with the best, you may not be able to be picky on the shared ethos. This is particularly true for those struggling with building a career and getting a permanent position, the advice of those at the hiring table will always sound louder. The reward system seems at times to be stuck in a place where incentives are (at all levels) stacked against Open Science; “rewards” are distributed at the “researcher” level. Open Research is about a solution to a problem, not to someone’s career advancement (although that should come as a side-effect). It is not surprising then how little value is placed in whether one’s science can be replicated or re-used. Once the paper is out and the bean drops in the jar, our work is done. I doubt that even staffing committees or those evaluating us will even care about pulling those research outputs and reading them to assess their value – if they did we would not need to have things like Impact Factors, h-index and the rest. And here is the irony – we struggle to brand our papers to satisfy a rewards system that will never look beyond its title. At the same time those who care about the content and want to reuse it are limited by whichever restrictions we chose to put at the time of publishing. I think we need to be sensitive to the struggle of those that might want to embrace open science, but are trying to negotiate the assessment requirements of their careers. Perhaps getting more people who embrace these principles at staffing and research University Committees might at least provide the opportunity to ask the right questions about “value” and at the right time. If we can get more open minded stances at the hiring level, this will go far in changing people’s attitudes at the bench. I, for one, find myself in a relatively good position. My continuation was approved a few weeks ago, so I won’t need to face the staffing committee except for promotion. A change in title might be nice – but it is not a deal-breaker, like tenure. I have tried to open my workflow in the past, and learned enough from the experience, and will keep trying until I get it right. I am slowly seeing the shift in my colleagues’ attitudes – less rolling of eyes, a bit more curiosity. For now, let’s call that progress. What did the public give you the money for? It has been a busy Open Access Week for me. My last (well almost last!) duty is today at 4:00 pm at the Old Government House at the University of Auckland. Stratus has organised a panel and invited me to participate, and I have just uploaded my upcoming presentation to Slideshare. If you have a chance, we would love to see you there! Oh, and thanks to Nat for 4-short-linking my previous post! 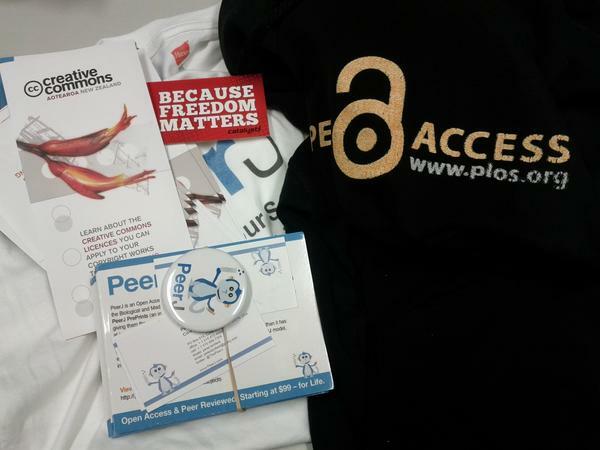 So, it is Open Access Week, so I thought I should drop by and tell you what I have been up to other than collecting swag. It has been a very busy time. Heaps of things have happened and I am thrilled of how much louder the conversation about Open Access has become. So what I thought I might do on this post is link to some of the stuff that I have been doing over the past year. Back in July, Cameron Neylon and I ran a Workshop on Open Research in the New Zealand context as part of the eResearch Symposium. It was great. There was a great crowd and Cameron did an excellent job moderating, and all we learned and gathered is being shared here. I think that one of the take-home messages from that workshop was the need to build a solid community of practice and communicate more actively with each other. The symposium ran a bit after the Finch Report was released and PeerJ came out of the closet. So while Cameron and I were at Wellington we got a chance to chat about Open Access with Peter Griffin on the Sciblogs podcast. Flew back to Auckland and hardly caught my breath before heading to Net Hui. Matt McGregor from Creative Commons Aotearoa New Zealand had asked me to participate in a panel on ‘Open in Tertiary’. I said yes. Then he texted me to ask me to do a radio interview about the panel with bFM. Have you ever tried to a radio interview over a mobile trying to find a quiet spot in Sky City? Well, this is what that sounds like. Not long after I get a phone call from Radio New Zealand while I am on the bus. Dodgy connection. I was sick so I also had a dodgy brain. Nonetheless, kudos to the reported who managed to seep through the nonsense generated by a sickly brain and make something of it. The recording is here, and I was surprised to find that the clip also interviewed Peter Gluckman and Cameron Neylon. All throughout the year, a bunch of us have also been busy organising a conference for next year on Open Research. You can find info on the conference on this site. And yes, we will take your money so just contact us if you can support us. And I am currently going through the nominations for the New Zealand Open Source Awards – this year featuring Open Science. The finalists should be made known soon. Some great nominations! And today begins Open Access week, and so back to work. I already published a post in Mind the Brain on my experience as an Academic Editor in PLOS ONE, and another post appears in Creative Commons Aotearoa New Zealand site on the cultural heritage of science. Matt McGregor, our CCANZ lead has aggregated a wonderful collection of posts on their site – worth going onto the OA week page and read them! I will be in two panels, one at Waikato University on Tuesday and one at University of Auckland on Thursday, and of course I will be stalking Alex Holcombe as much as possible while he is visiting Auckland. So if you have a chance to come meet and greet, I am sure that by the time this week (and this year!) is over, I will be welcoming that drink! You can find activities for Open Access near you at the Creative Commons ANZ site.